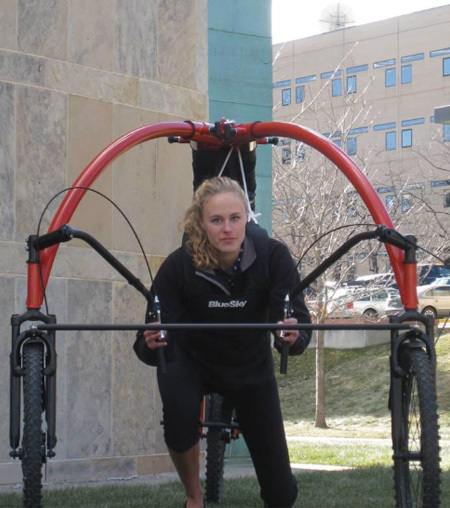 StreetFlyer is a human powered vehicle designed for people who want to experience hang gliding without the associated risks. The transition from running into a flying position is facilitated using a body harness that is attached to the structure. nice girl, not so nice bike? Let’s see it go up the hill. it’s interesting but i’d like to see it go up the hill yea! If i see someone using one of those, I will shake my head. Unfortunately unlike hang gliders there appears to be no way to use thermals to gain hight, so this model is a bit of a one-trick pony sadly. There is a roller-coaster in the UK called ‘Air’ which allows such a riding position, but is a little faster. I would appreciate less of the totally useless stuff here on toxel. It makes the design industry seem like a joke. whats wrong with a ordinary bike? And it’s got disc brakes!!!!!!! Just when I thought nothing could get more stupid on this blog, something comes and steals the crown. It would be fun in hilly areas if you could get up enough speed to make it back up the hills. This is really stupid. I mean , really? What’s wrong with regular bikes? 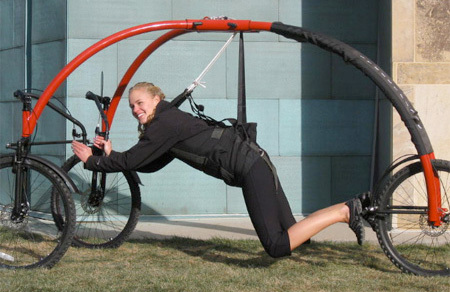 How stupid is that…I think hang gliding is much safer! This is NO fun and too much hassle! Just ride a bike instead! this is like the “IT” by mr/mrs garison..
HAHAHA this is a really bad invention! Every great idea has to start somewhere. I’m guessing Leonardo Da Vinci’s inventions brought on the naysayers during his time, but he turned out to have a couple good ideas. 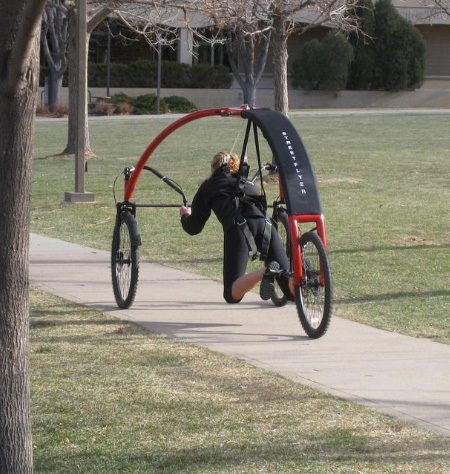 I encourage people to appreciate the creativity of this persons passion towards hang-gliding, and offer constructive criticism as opposed to the purely negative remarks…. Let he who is without fault cast the first stone! 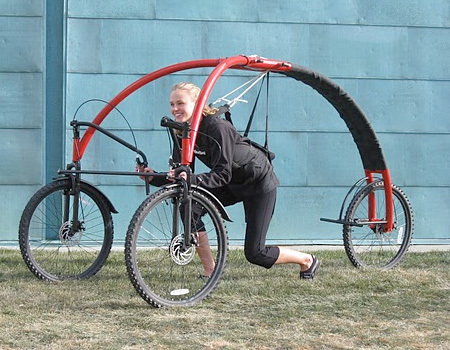 great prototype… there are some things that look a bit concerning about this though. 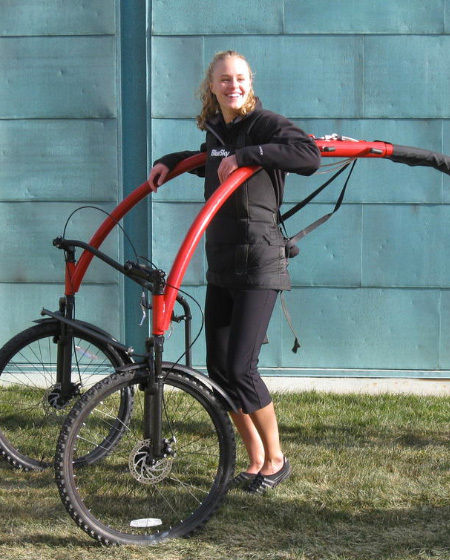 The steering looks akward and cumbersome and it seems to be purely gravitational to gain momentum if there were a pedal system to help in going up hill that would help make it human powered. however the only energy transfer the human is offering in this current state of the prototype is the weight which gravity is pulling on. The wheel base is a bit far in expanse to be able to negotiate a tighter turn. over all it’s a great idea those are simply my thoughs on how it could be improved upon.